Miso soup can be made in an endless combination of ways. 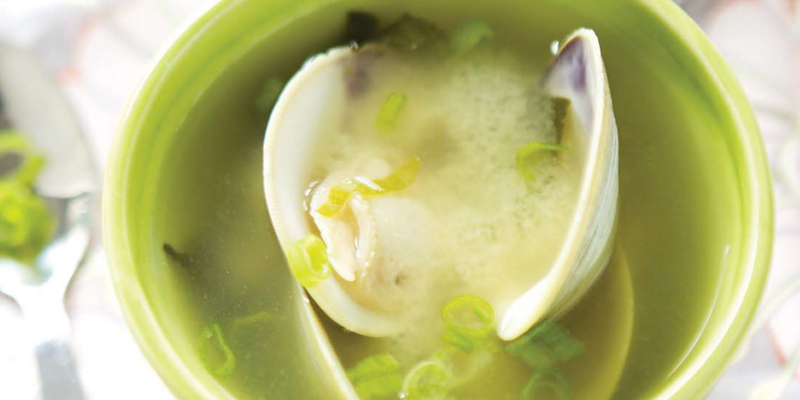 This soup with clams is special because of the rich broth, which is enhanced by the clam liquid. With kale, it is a complete meal in one. Scrub the clams, and place them in a bowl; cover it with a kitchen towel, and refrigerate them while you prepare the soup. Wash the potatoes, and cut them into quarters. In a large pot, bring to a boil the potatoes with enough water to cover them. Simmer for 10 to 15 minutes until the potatoes are soft when pierced with a knife. Drain. In another pot, combine the cold water and seaweed and bring it to a boil. Cover and simmer for 10 minutes. Add the miso paste, kale, and potatoes, and cook for 5 minutes. Add the clams and cook until all of the shells open up. Discard any clams that have not opened up after 4 to 5 minutes. Sprinkle with scallions and serve warm.